SAN DIEGO Three Blind Mice founder, Scot Dietz, was recently recognized by the San Diego business community as an outstanding young entrepreneur. 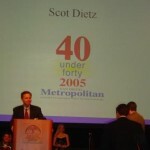 Dietz along with 39 other high achievers under 40 years of age were honored in the 6th 40 Under Forty Award program sponsored by San Diego Metropolitan magazine. This prestigious award is based on business accomplishments, affiliations, community involvement, achievements and awards. Congratulations Scot from the entire 3 Blind Mice team!